Altmetrics: A Practical Guide for Librarians, Researchers and Academics. Andy Tattersall (ed.). Facet Publishing. 2016. Back in 2010, a new field of scholarly communication research was burgeoning: altmetrics. Altmetrics (initially standing for alternative metrics) are part of the broader range of scholarly metrics, such as the impact factor, citation counts or the h-index. They primarily intend to provide an indication of online and social media attention to any research outputs (as opposed to established metrics focusing mainly on peer reviewed publications only) by capturing their social influence. By doing this, they aim to improve our understanding about how information about research propagates, how it is used and how scholars are engaging with these new forms of scholarly communication. This review by Nathalie Cornée originally appeared on the LSE Review of Books blog and is reposted under the Creative Commons license (CC BY 3.0). Today, altmetrics are no longer regarded as alternative, but rather as complementary to traditional metrics. Many advocate their use as ‘early indicators’ of article usefulness. Indeed, research that used to take months or years to reach readers can now find them almost instantly via blogs, Wikipedia, social media networks, etc. Activities that used to be hidden, such as reading or downloading a paper, are now visible and therefore traceable (see Ben Showers, Chapter Four). Many stakeholders within academia are looking for new ways to measure how outputs are consumed online before they even start accruing citation counts (which take years for most disciplines). In Altmetrics, the authors begin by explaining where altmetrics sit within the research landscape, the importance of research evaluation for scholarship and employment decisions, benchmarking purposes, funding opportunities, etc, as well as the notion of prestige or influence which is deeply rooted within academia. Chapter Three, ‘Metrics of the Trade – Where Have We Come From?’ by Andrew Booth, provides a comprehensive review of the established metrics, and is a must-read for anyone less familiar with the broader world of scholarly metrics. By explaining their goal as well as their actual use in assessing individuals, groups or journal performance, Booth opens up the context in which altmetrics started to flourish and the gap that they have been trying to fill. Throughout the book, Andy Tattersall insists on the cultural shift that academia has witnessed over the last decades: namely, since the development of the Internet and its related technologies (including MOOCs, Big Data, Open Access). Even though scholars were initially relatively quick to adopt some of the new means of communication that the digital world had to offer, such as emails, Tattersall reminds us that a vast majority of scholars tend to be rather apprehensive in utilizing some of the new means of scholarly communication, firstly because of the downpour of technologies and platforms now available to them, and secondly because they rightly question their validity. While the first half of Altmetrics focuses mainly on setting the scene for new scholarly communications, the second half tends to emphasise the vital role that library and information professionals can play in helping staff discover and communicate research and ultimately reinforce their outreach activities within their own institutions. Library and information science (LIS) professionals are clearly the first target audience of this book, even though academics, publishers, funders or stakeholders of the research evaluation process could apply the recommendations to some extent. That said, throughout the book the authors stress how well-suited librarians are to supporting researchers. Indeed, librarians have developed a key presence within the research cycle by being experts in managing academic content either through collections, subscriptions or institutional repositories. They are also highly regarded within the academic community for their advice on copyright issues, support with information discovery and literacy, and have more recently become very proficient in facilitating open access publishing. Chapter Ten, ‘The Connected Academic,’ particularly struck a chord with me as Tattersall relays some of the major and very legitimate questions scholars tend to have about altmetrics, including ‘is this system good quality?’ ‘is this system stable?’ and ‘why use this technology, could it just be a fad?’ (141). If LIS professionals succeed in answering some of these questions that academics (or research administrators) may have by not providing them with just technical answers but rather by tailoring their response to each individual case, this will indeed help them strengthen their relationships and role within their organisation. I would have liked this chapter to go even further and provide successful stories of LIS professionals doing just that as every scholar will have different reasons for developing their online presence. As the subtitle of Altmetrics stresses, it aims to be ‘practical.’ Chapter Eight, ‘Resources and Tools,’ written by Tattersall, provides a short introduction to 41 resources including the major altmetrics tools as well as many social media platforms, some of which have an academic focus while others tend towards the mainstream. This list was useful in itself as some were new to me, but the real difficulty we face as LIS professionals is convincing our academics how valuable these tools can be to them and which ones to select and invest time in. Here again, concrete examples of scholars having developed strategies and workflows in which they have effectively combined these various outreach activities of sharing, connecting and measuring would have been beneficial. Tattersall does include, however, some helpful tips and tricks, such as identifying a ‘twin’ to demonstrate the value of disseminating research and engaging online (150). The author defines this as someone who would be a scholar’s highly respected peer, but based in another organisation and who has been successfully active on social media platforms. The field of altmetrics has grown exponentially to the point that they are now considered as part of the basket of metrics recommended by the Leiden Manifesto or the Metric Tide report, which both advocate the use of responsible metrics. The field has also attracted lots of groundbreaking research about the opportunities and challenges they bring in terms of their meaning or validity. 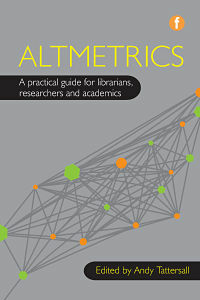 Altmetrics: A Practical Guide for Librarians, Researchers and Academics is very welcome as it is one of very few textbooks revisiting the theory behind the growth of altmetrics, providing a comprehensive snapshot of what they look like today and demonstrating their value if applied in a meaningful manner. All in all, this is a worthwhile read, especially for any LIS professional interested in improving their understanding of altmetrics. This entry was posted in Bookshelf and tagged Altmetrics, Leiden Statement, Metric Tide. Bookmark the permalink. Post a comment or leave a trackback: Trackback URL.